For my first spotlight I thought I’d talk about a book from a relatively new author and one that I feel was not met with the accolade it deserved, That’s not to say that this book did badly, It’s just that I happen to think that it is one of the best books in the fantasy genre of recent years. Before I talk about my own views I thought it would be best for me to give a basic outline of the tale (don’t worry no spoilers here, little more than a blurb.) The initial set up for ‘The Painted Man’ is your typical fantasy affair: tiny villages,carts,blacksmiths and young boys dreaming of adventure. Although not terribly original Brett presents these ideas well and doesn’t labour too long over the generic set up and quickly moves into the meat of the book. That meat comes in the form of the antagonists, not rival kings or bandit leaders as one might expect but ‘Corelings’ terrible creatures of elemental power that rise at night to prey on unprepared townsfolk, the only defence people have from these monsters are ‘Wards’ symbols of power that can be used to keep them at bay. 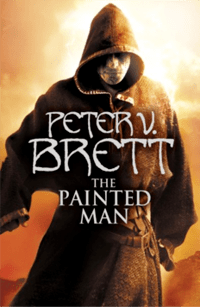 With this relatively simple set up Brett runs with it creating a beautifully crafted fantasy novel centering around the young boy Arlen who quickly becomes much more than the village boy he begins as. This book is the first of three, it’s sequel ”The desert Spear’ is already out in hard back and the final book is launching early next year. I urge people to go out and read these novels because they are written with such attention to detail and love for the world that they appear rich and vibrant, the plot is engaging ad actually not as predictable as many fantasy novels seems to be. Perhaps my only issue to be taken with the book is that the figure of ”The Painted Man’ appears rather late in the book, somewhat like the Hulk film,perhaps a little too much time is taken in building up his arrival, not to say that the rest of the book is boring, but the title does cause readers to wonder when he will turn up. I give this book 4.5 stars out of 5 – A must read fantasy novel. Welcome to the blog! It’s great to have another addition to our family. I do love a good fantasy novel. Will check this one out! Welcome to We Heart Reading! It’s good to have another lover of fantasy on board.